I’m noticing a major trend in the cosmetic gift giving selection this year. That’d trend would be minis! I mean we obviously love full size products but hell don’t we love mini versions that we can tuck in our purses and makeup bags for touch ups here and there and everywhere? Urban Decay has graced us with it’s mini 24/7 Kit which you can check out by clicking here. Benefit has it’s new Powder Pop! palette available which contains mini versions of it’s popular powder line. You can droll over it by clicking here. Stila has a mini kit of it’s lipglazes which I purchased yesterday! You can see my first impression here. And now some more minis that are popping up at Sephora for the Holiday Season! Let’s have a look. Ok so these might not qualify for mini but I’m making the big assumption these aren’t the big sizes. 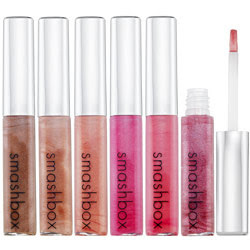 The best deal yet (I believe this might be full size but don’t quote me on that) would be the Smashbox Light Speed Lip Gloss Collection for $29! Tarte has a new trio of cheek stains as well which are $30 and entitled We Wish You Happiness Mini Cheekstain Set. This isn’t very new because Tarte has these as normal catalog items and plus they offer them almost every holiday season however from year to year the case they come in changes which is fun! 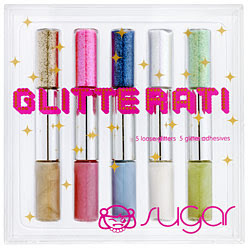 Minis aren’t new to Sugar Cosmetics but they always have some of the cutest minis I’ve come across 😉 This one is called Glitterati and has glitter on one end a light matching cream base on the other! The set is $32. So..what’s so great about minis anyway? Well minis are great for toting around for touch ups plus they are so lightweight that they fit in the smallest of places which makes for easy storage! You also get a slew of variety and bang for your buck by purchasing these sets! It’s such a great way to try several items in one cute kit. Get shopping 😉 Grab some of these as gifts while you’re at it! 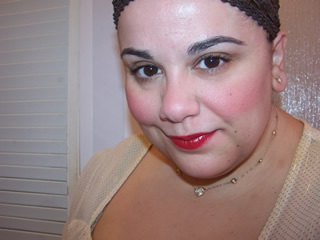 What to Purchase During Sephora Friends and Family 2011: Lipglosses are People Too! I don’t know why, but minis are always cuter. Continuing from yesterday, the Sapphire and Diamond are on my wish list but I haven’t gotten yet – thinking next week. By the way, the Givenchy holiday collection just arrived today at Saks NY. I ordered the solitaire and lash sparkles. yay! Can’t wait for you to tell me how you like them when you get ’em! I was stalking Saks website and Sephora. Have they arrived in store or online? I think I’ll head over after work if they are in store (I’m in New York too!)! Thanks for the heads up!!!!!!!!!!!!!!! You’re my hero thanks darling! I just called my rep and she said don’t bother coming down she’ll ship it all out free to me with a load of goodies! but not the nail polish! Now I’m debating on the nail polish hmmmm..I haven’t heard anything about it or seen images. What about you..? I bite my nails so it’s somewhat pointless but I am curious what the color is like! Yea!!! Glad to give you the tip off so you didn’t have to continue stalking the sites and potentially miss such a great collection. I skipped the nailpolishes because they are very sheer and shimmery. 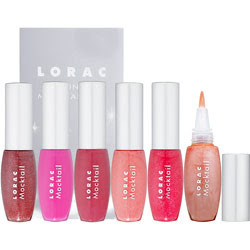 They match the lipgloss colors (according to Susan at Saks). I stick with dark colors in an attempt not to bite my nails. I think you’ll be fine without the nailpolish if you got the lippies. Did your rep tell you about the solitaire box? Apparently it’s like a ring box. Too kawaii! I think you’re right. Hey I it my nails too so it’d be a waste for me to bother! Gosh me too! I’d say we get it tomorrow at the latest. They normally ship uber fast from store! Again, thanks, I owe you one! I don’t think my makeup collection can compare to yours. I bow to the gloriousness of your collection. It’s always fun to see what you have hiding in your stash. I have discovered Givenchy is one of those truly LE companies. They must’ve taken lessons from Kanebo and Kose! Yes, the powder case for the prisme solitaire is supposed to look like a ring case! I think the idea is the powder is supposed to look like a diamond when opened! In staring at the photos on Makeupbag, you can almost see it. I wonder how Sephora posts the Givenchy items. It always seems like it is OOS when they post it. And yes, we can grin and admire the diamonds. One word my friend…Chantecaille…the muse owns no Chantecaille 😉 hehe! It’s far and between that companies come out with true LE cosmetics so Givenchy stands apart on that 🙂 Agreed on all accounts! I have no idea. I don’t think I’ve ever been successful ordering from Sephora aside from the Blush from the Fall Collection. Aside from that I’ve never had any luck purchasing Givenchy from them at all! I think I should remove my post alerting people the collection is out! shhhh..lol!